A quadcopter drone is used for capturing photos from above. This page contains a sample of our aerial photos. This page provides information on our aerial photos using the quadcopter - a drone which is "the eye in the sky". It shows a sample of our aerial photos of the Holy Land and links to the reviewed sites. A quadcopter is an unmanned aerial vehicle, or drone, which is equipped with a camera. It is lifted and propelled by four rotors, controlled by manual commands from the ground. 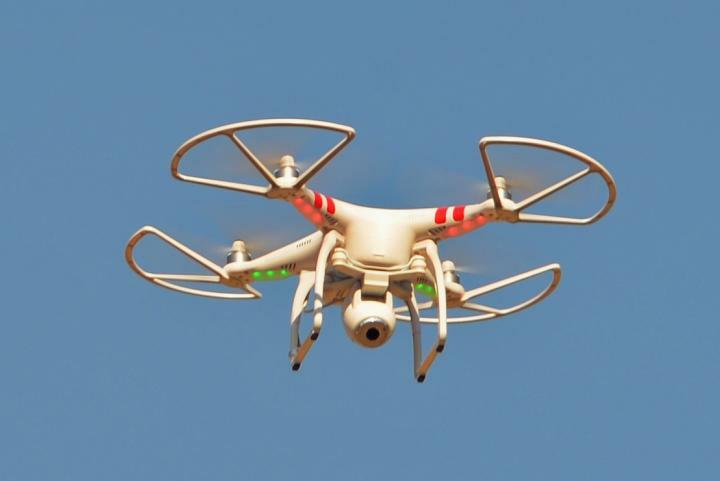 Biblewalks is currently using the model "Phantom 2 Vision", which is manufactured by DJI. This flying platform is equipped with an integrated camera of 14 Mega pixel resolution, and can capture both still images and 1080p Video. The quadcopter can be commanded to a maximum range of 300m. The flight control of the quadcopter is via a panel with two joysticks and switches. The imagery is viewed and stored in real time. 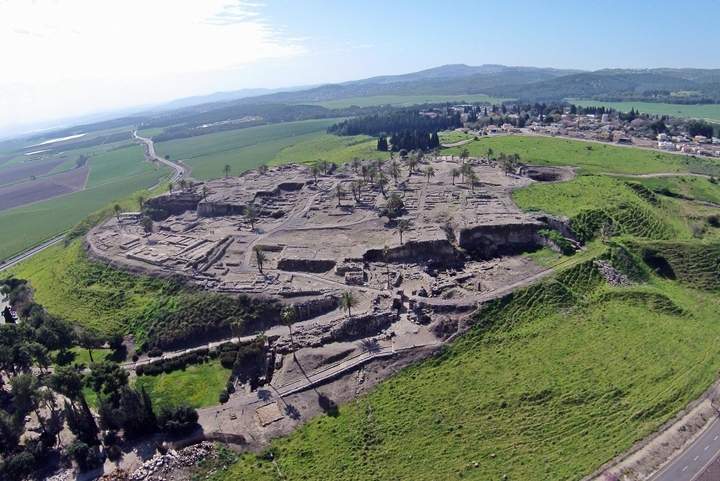 The flying camera is a great asset for photographing ancient sites and excavations. It provides another perspective on the topography of the place, with high resolution imagery. The device is launched and brought to a desired altitude in a few minutes, and can be easily maneuvered to the desired location for shooting the pictures. * April 2017 update: New Mavic Pro quadcopter advances the quality of our aerial shots! In the following section is a sample of the photos captured by our quadcopter. These famous caves were were dwelling sites during prehistoric times, and are listed as UNESCO World heritage sites. The aerial view shows the site from the west. The visitors center occupies the white round structures, with a parking lot on its south side. Behind it, in the center, is Nahal Ma'arot (the caves creek). On the right (south) side is the cliff where the four prehistoric caves are located. To read more about the site or other sites in this page, simply click on the header of the site. The photo shows an aerial view of the site from the west, as captured by a quadcopter. On the top of the hill a set of caves can be seen, and just beneath it the walls of the fortress. In the center right the Romans built the ramp in order to crush the walls. On the south-west side of the Arbel cliffs, inside the modern agriculture Moshav Arbel, are ruins of a Roman/Byzantine period village scattered along the hillside. A grand Byzantine period synagogue was excavated there in 1905 by the archaeologists H. Kohl and C. Watzinger. New excavations (2012) were conducted in the area of the synagogue. This aerial view is of March 2014, with a scaffolding on the monumental door, and new trenches on the south side. An aerial view, as captured by a quadcopter in May 2014 from the south side, is seen in the following photo. A road traverses the hill from its west side, passing near a large cave. An Israeli flag is located on the top, as in all ancient sites of Karmiel. 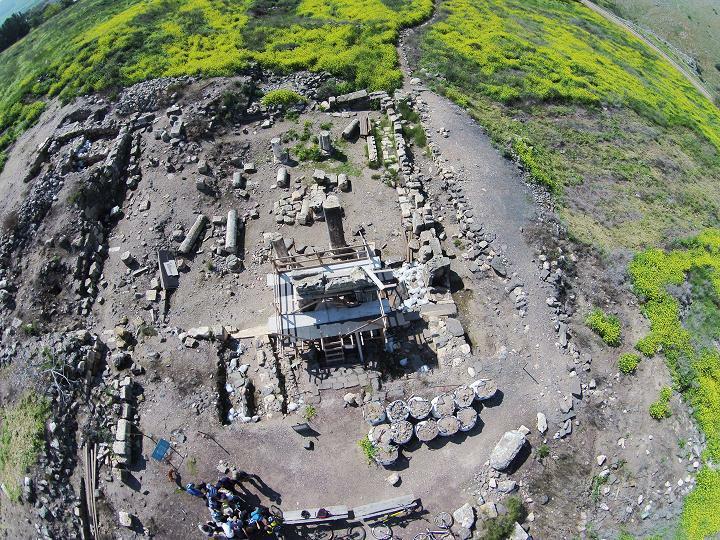 A Roman period synagogue was excavated recently in Khirbet Veradim, on the south side of the village of Wadi el-Hamam. This mound, identified as the Biblical city of Khali (Joshua 19:25), is located in the entrance to the Zippori valley. It is a round hill (133M height, 700 sq M). On the top of the hill is a flat terrace (size), which was the center of the fortified small city. The site was one of the agriculture villages that were under the protection of the fortified city of Khali. It is located in the valley south west of Tel West Khali, and was a small farming village. The pottery in this site is from the late Israelite and Persian period. For a video clip, which was captured by the quad-copter above Kh. Govit, view it on Youtube. The next picture is an aerial view of Tel Zavat, as seen from the west side (captured Feb 2014). On top of the ancient site are several modern residential houses. In the left and right backgrounds are sections of the new Kerioth-Bypass highway. This was one of the many sites along the ancient coastal highway. According to archaeological survey, the majority of the findings are from the Israelite period through the Byzantine period. The Ottomans built a large fortified Khan in the 16th C, which served as a hostel for the caravans that passed through the Holy Land. An aerial view, as captured from a quadcopter from the west side, is seen here. Excavations in the Egyptian Governor's residence, seen below in an aerial view from the north side, are from the Late Bronze Age (1,550-1,200 BC). The photo below shows a southwest view of Tel Avdon. The hill rises 70M above the Kziv creek with a very steep slope. This was the location of Biblical Levite city of Avdon or Abdon (Joshua 21: 3, 30): "And the children of Israel gave unto the Levites out of their inheritance, at the commandment of the LORD, these cities and their suburbs.... And out of the tribe of Asher, Mishal with her suburbs, Abdon with her suburbs". 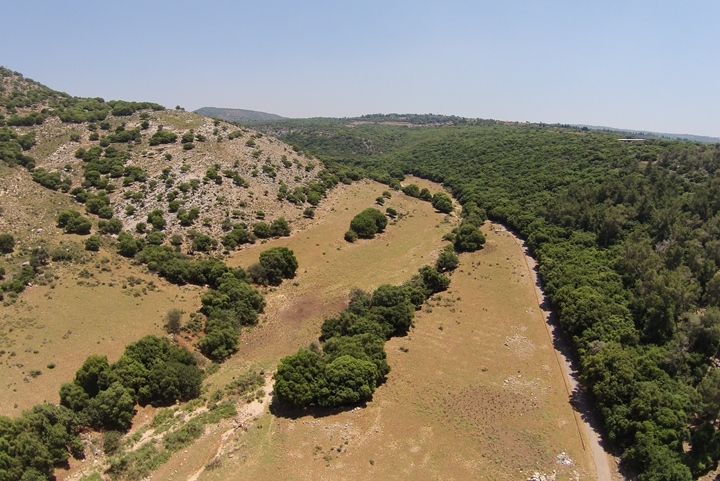 A quadcopter view above the road on the south side of Khirbet Suggar, located south of Kziv stream. Traces of the ruins of the Roman/Byzantine village cover the hill. A rectangular walled area, which was an ancient sheepfold, is seen in the center. The Kziv stream flows just after the hill. Across it, on top of a steep hill, are the ruins of the Biblical city Avdon. In the far left background is the Mediterranean Sea, and the mountain of the "ladder of Tyre" (Sulam-Tzor) is seen in the far left background. Hannathon was an important Biblical city in the heart of the lower Galilee, on the junction of ancient crossroads. An aerial view, as captured by a quad copter, was viewed from the west side. The top of the hill is at 196m above sea level, about 50m above the valley around it. To the east of the site is a reservoir lake of the national water channel. Behind it, in the far background, is Sepphoris. Further east is Nazareth. Khirbet Shimshit is a Roman/Byzantine village 3KM south-west to Sepphoris, on a hill overlooking the Zippori creek. A Roman road passed at its western foothills, the main road from Sepphoris to the south. The quad copter view shows the eastern side of Usha, looking towards the north-west. Scattered ruins are all what remained from the Arab village, which was built over the Roman-period site. A group of 3 Roman-period winepresses are located on the located on the east side of the village. An aerial view of the eastern hill is shown from the north side. Only the north half of the mound remained intact, as modern construction cut away sections of the site. The site of Ashdod Maritime (Hebrew: Ashdod Yam) is located on the coast, and served as the city's harbour since the Iron Age (8th Century BC). The harbour continued to function through the Hellenistic and Roman-Byzantine period (renamed Azotus), up to the Crusader period. A 7th Century citadel was constructed on the north side, used by the Muslim rulers and the Crusaders to protect the harbour. To the south of the Citadel is the Roman and Israelite mound, yet covered by the sand dunes. An Iron age agriculture settlement was excavated in Izbet Zartta, a small hill on the western hills of Samaria close to the ancient city of Aphek (Antipatris). It is identified as Ebenezer ("Stone of Help"), the place where the Israelites camped during their fatal battle with the Philistines (1 Samuel 4 1): "Now Israel went out against the Philistines to battle, and pitched beside Ebenezer: and the Philistines pitched in Aphek". This village is on the northern side of Sea of Galilee, and was the center of the activities of Jesus and his town during that time. A grand 4th C Ad Synagogue was excavated, which stood over the Synagogue from the time of Jesus. The nearby Greek Orthodox Church is a charming place in the site of the ancient village of Capernaum. Ruins of a Roman/Byzantine town, located above the north side of sea of Galilee, and is referred in the new testament as one of the cities condemned by Jesus. Ruins of a 5th C AD church and monastery at the traditional location of Jesus miracle at Gadarenes/Gergesa - healing the madman, driving out his devils into a herd of pigs who then drown in the lake. Tel Afek (in the Galilee) is a Biblical city on the ancient Via Maris road, south of Acre. On the north side are ruins from the Hellenistic/Roman periods, a two-story fortified building, and a flour mill dated to the Crusader and Ottoman periods. In the north-east side of Tel Afek is the Ein Afek nature park. The 30 springs of Afek are the sources of the Na'aman river. Ruins of the ancient port city of Haifa, located on the west shore side of Mount Carmel. This aerial view is above the south side of the mound. On the south side of the mound is an excavated area with storehouses and installations. In the upper side of this view are the ruins of a Byzantine period monastery. The ancient Phoenician port city is located on a mound on the Carmel coast, and was one of the greatest cities along the northern shore. This view shows the ruined Crusaders fortress, north of the Roman city. The next view shows the north side of the ruins of the Roman city, adjacent to the Crusaders fortress. A grand entertainment place was built during the Roman period by Herod - a large Hippodrome in the shape of a long "U" (50 X 250M), with 10,000 seats in 12 rows. In this amphitheater the Romans conducted horse races (Hippo in Greek), special events, and games. A large Roman theater, also built by Herod the Great, is located at the southern side of the city. One of the famous sites in Caesarea is the aqueduct, which brought water to the city. This photo shows the edge of Mt Carmel from the North West side. Khirbet Dubbah is a ruined Roman village located on the eastern side of Mt Carmel. In this photo the center of the site is on the left side. On the adjacent hill is the Mukhraka, where a small Carmelite order church named after Elijah marks the traditional site of his victory over the Baal prophets. You can also watch the above views as part of YouTube videos: West and East. Tell Ya'anin is identified as Biblical Neiel (Joshua 19: 24-27): "And the fifth lot came out for the tribe of the children of Asher ... And their border was ... and Neiel, and goeth out to Cabul on the left hand". This aerial view shows the ancient mound from its south side. Traces of the ancient structures are seen close on the summit and on the upper level of the foothills. Behind the hill is the valley of the Hilazon stream. In Tel Gamma, located on the bend of the Besor brook, are ruins of an ancient Canaanite. This city is identified as Yurza, a city referred in the conquest of pharaoh Thutmose III (reigned 1479-1425 BC). The city was an important trading post on the caravan route from the Mediterranean to Arabia, and one of the Philistine cities during the Iron Age. Tell Kedesh in the Upper Galilee is composed of an an ancient mound (with North and South hills) and a lower east hill, with a spring in the center. A large Persian/Hellenistic Administration Building ("PHAB") was excavated on the south most side of the mound. The ruins of this period are located on the eastern Tell Kedesh, a low hill on the north-east side of the ancient Biblical city. Ruins of a Roman temple, dated to the 2nd and 3rd C AD, are located on the southern side of the eastern mound. This aerial view shows the plan of the temple from the east side. Tel Tanninim ("Crocodiles mound") is the ruins of the city of Crocodilopolis, situated at the mouth of Tanninim stream. Nearby is a fishermen's pier, village and beach. The next aerial view, with a view towards the east, shows the stream and Jiser e-Zarka in the background. You can "fly" over the site with the following Youtube videos of Tel Tanninim and the Tanninim stream. This famous site is situated on the gateway on the road linking North and South of Israel, about 30 Km south-east of Haifa. The archeologists uncovered 26 layers of ancient cities, starting before the bronze age (4000 BC) until the Greeks (4th C BC). This photo is an eastern view of the city of Haifa, its port and the bay of Haifa. The Kishon river, which flows here into the bay of Haifa, is one of the largest in Israel. Its drainage basin includes an area over 1000 square KM, where one third of this area is in the Jezreel valley. Prophetess Deborah sang the famous song after the victory over Sisra: (Judges 5 21): "The river of Kishon swept them away, that ancient river, the river Kishon". The site was one of Zebulun tribe cities. An aerial view of the site was captured from the north side by a quad copter drone. Yiftach-El brook is on the right side, flowing to the south into the Zippori brook towards the far background. The ancient city is actually covered by this large green field. During the Bronze Age its structures were spread out to the east of the brook. A small section of its "upper city", which is the only visible ruins today, is located in the group of trees behind the modern water pump. In Kh. Seraf (Semah), located in the Western Upper Galilee, are remains of an ancient multi-level Tel. Another Roman/Byzantine village, Ramah, was established on its east side. This aerial view shows Betzet creek, while the ancient sites are on the hills above its south (right) bank. The ruins of the White Mosque (Arabic: Jamia el Arbain Meghazi), also known as the mosque of the 40 Champions, are located in Dani Maas street, Ramla. It was built in several phases, during the Umayyad, Ayyubid and Mameluke periods. The drone view shows the Minaret tower and ruins from the north side. You can also "fly" over the site with this drone video. This is a south-west view of the ancient city. Beit Shearim (Besara) is located on the summit. On the left (north) corner in the background is the location of the national park of Beit Shearim, with its famous catacombs. On the right is a new section of the catacombs. You can "fly" over the site with this drone video. A west view from the summit shows the ruins of a large Basilica-type public house dated to the Roman period. Mt Carmel is seen in the background. On the east side is the tomb of Sheikh Ibrik, overlooking the Jezreel valley. This drone view shows the center of Lod from the north side. The Church of St. George is located to the left side of the minaret of its adjacent mosque. An impressive 19th Century Khan (inn, caravansary) located near St. George. A major fortified Canaanite and Israelite fortified city, one of the famous Biblical cities. This view is over the ruins of the Israelite period city, with the city gate ("Solomon's gate") with its 6 chambers on the right side. A flight over the site can be seen in this drone video. Ruins of a Franciscan chapel on a south hill near Mt Precipice. It was named after the traditional site where Mary, mother of Jesus, stood when her son was about to be thrown from the hill. The chapel overlooks Mt Precipice (left background) and the south side of Nazareth (right background). A flight over the castle can be seen with this Youtube video. Tel Regev was a biblical fortified city that was one of the passing points across the Kishon river. Its history spanned from the Early bronze age to the Byzantine period. It belonged to the Asher tribe, but its identification is not certain. "Fly" over the site with this drone video. Ezekiel 1:16-18: "The appearance of the wheels and their work was like unto the colour of a beryl: and they four had one likeness: and their appearance and their work was as it were a wheel in the middle of a wheel. When they went, they went upon their four sides: and they turned not when they went. As for their rings, they were so high that they were dreadful; and their rings were full of eyes round about them four".